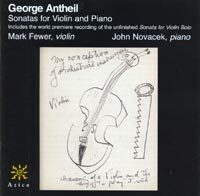 GEORGE ANTHEIL (1900-1959): Violin Sonatas Nos. 1, 2 and 4, Sonata for Violin Solo. Description: The first two are from Paris 1923 - the height of Antheil's "Bad Boy" period. In four movements, No. 1 is the more percussive of the two, with incessant rhythmic propulsion knocked off balance by metric displacements, irregular accents and sudden silences. Extended playing techniques abound, from hammered clusters in the piano to non-pitched scrapings and playing percussively behind the bridge for the violin. The 8-minute No. 2 is a paean to the banality of popular music, as if one were randomly turning a radio dial in 1923. No. 4, however, is from 1947-48 and, like his symphonies of that period, is neo-romantic and well-behaved, with influences from Prokofiev, Shostakovich and Copland. The unfinished, 11-minute solo sonata is a world premiere recording, written in 1927 for Ezra Pound's girlfriend Olga Rudge (also the dedicatee of No. 1). It's a rhapsodic flow-of-consciousness piece with plenty of Bartókian elements (Antheil was also a friend of Zoltán Székely, who performed the other two sonatas). Mark Fewer (violin), John Novacek (piano).